As you get older, birthdays can become a bit dull. Same nights out, same cards, gifts, meaningless well wishes on social media – there’s nothing to be excited about any more really. That is, unless you book yourself into a zombie boot camp. Steer clear of spa days and nights out on the town and give yourself a birthday to remember. You’ll be celebrating your special day actually making memories, and giving yourself and your friends an epic challenge. No matter how old you are a zombie boot camp will force you to push yourself and be confident, physical and brave. Forget the cake and cards and battle some real life monsters, just make sure you don’t get infected or you might not make it to your next birthday…. Most men love zombies – fact. Zombie movies, tv programmes, video games – they’re all much loved by men all over the world. Which is exactly why a zombie boot camp is the ideal activity for a stag do. It’s the end of an era, you’re all ‘growing up’ and moving forward with your lives – what better way to cement your friendship than by battling zombies as a team? Sure you might question your friendship along the way when your bestie opts to hot foot it round the corner leaving zombies to feast on your brains, but that’s what friendship is all about right? OK so we know men love zombies, but the huge amount of women taking part in zombie experiences tells us that women do too! In fact, many women have done far better at dealing with those pesky infected lot than the men. So how about it? Is it time for your friendship group to ditch the makeup lesson and cocktail making class and say farewell to your freedom by taking out the undead? Chances are most of your group will have dated plenty of soul sucking, nonsensical individuals in the past anyway. An entire facility full of them? No problem. When you graduate from uni, you say goodbye to plenty of friends who were with you throughout the time you grew the most as a person. The times you cried about looming deadlines, sent out a million CV’s in a hope someone would give you a job so you could afford to go out, and the times you learnt how to cook a meal that wasn’t toast for the very first time. Graduation is amazing and heartbreaking at the same time, which is why it’s important to say goodbye to the most epic three years of your life properly. Get your uni crew together and say your final goodbyes before the world of work looms, in a place that truly challenges you all, and scares the living daylights out of anyone. Throw your graduation hat in the air and hot foot it to a zombie boot camp, where you’ll end your uni era making the wildest memories together. When you get a new job, you can be full of nerves and anticipation about meeting new people, taking on new challenges and working in a different environment. 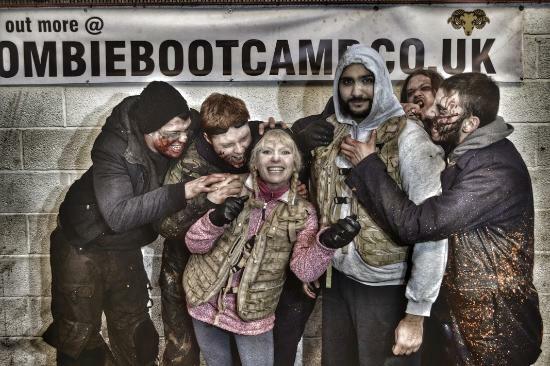 A zombie boot camp is the ideal experience to celebrate this momentous occasion. Why? Because no matter what your new job throws at you, it won’t ever be as scary as the bloody, rotting living dead running after you to get your brains.